I've mentioned before that I listen to a lot of podcasts when I'm running. Recently I made the accidental discovery that you can watch entire college courses on iTunes on various topics. There were a number that interested me, but I decided to start with a history course at Yale called Epidemics in Western Society since 1600. I don't have the textbook for the class, but I have been making an effort to read the books that are mentioned as well as watch films that are discussed. 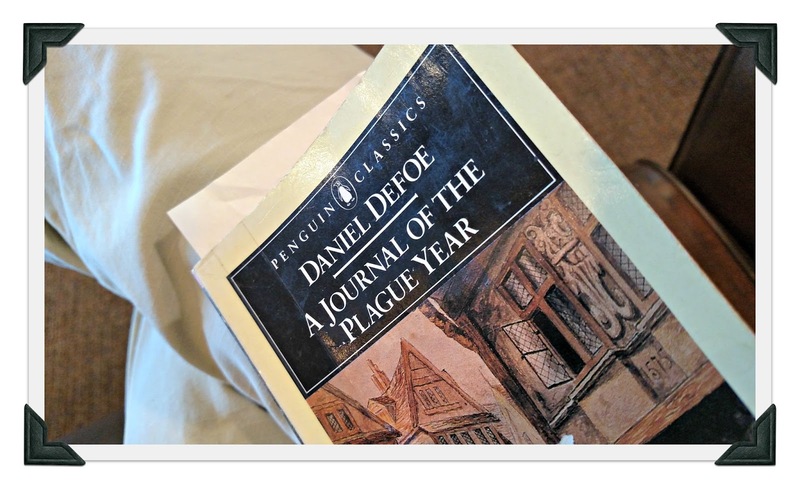 After watching the three lectures on the bubonic plague, I read Daniel Defoe's A Journal of the Plague Year. Like other books from the early 18th century, it's a little dry, and it does bother me that there are no chapters. However, if you want to experience what the day to day life was like during the terror of the plague in London in the late 1600s, it gives a realistic picture. At moments in the book, I felt that some things hadn't changed all that much, when considerating things that happened with the Ebola virus in 2014. I love to learn and I've enjoyed immersing myself in this fascinating topic (some of which, like the lecture on Hippocrates and the four humors, has been relevant to the psychology classes I teach). I do wish the course included the entire reading list - I have to listen for books mentioned in the lectures (next I'll be reading Pox Americana: The Great Smallpox Epidemic from 1775 - 82). Once I finish Dr. Snowden's course I have downloaded several other courses I want to take (there is an EMT course that I think will be very useful). These courses are all free! Just click on ITunes U to check them out. You can watch them on any computer and do not need a special device. It's an opportunity to 'sit in' on all the fun classes that you were never able to take when you were younger - only you don't have to take any final exams or write any papers. Readers, is there a class you'd love to be able to take? Interesting. I will have to check that out. Thanks for the tip!!! Since I'm running more I might consider sticking something other than AC/DC on my headphones. I like books on tape too and I'm reminded of Greg Bear's 'Blood Music' when I think of the plagues that await us in the future. I never listen to anything when out other that what is around me. Oh my gosh, thank you for telling us about this! I am going to check it out. There are so many different things that I'd like to know about, things that I never took time for in college or didn't know would be interesting back then. As far as epidemics, I'd like to learn more about the Spanish Influenza Pandemic around 1918. That was mentioned a lot when I was working for the health department and bird flu was what people were worrying about. Also, you might like the modern-day movie "Contagion," about an influenza virus that crosses species and spreads around the world. Makes you think about the world's response to such a catastrophe. Laurence Fishburne plays the CDC director and Matt Damon is a person who, for reasons unknown, is immune to the virus. I'd love to take classes to get my education degree. I have my masters, but by having my edu. degree I could teach little kids. Well, there you go, Lisa. Always amazed by you. Sally is right, Lisa. You never fail to surprise me. I happen to love courses in night school. Learning new things keeps the mind fresh and stops one from becoming old in self, that is what I have found as I have got older. University study for a Science Degree opened up the wonderful world of learning. I was fifty. Since then I have a thirst for learning new things, most of which are learnt from the Internet and YouTube. So well done, Lisa, for continuing to learn new things. At my age (69) you will still be full of the energy for life. It's always amazing to discover there are ways and means to continue learning. . . . . . just look what the Internet has done for us! All we need now are more hours in the day to spend looking, listening and soaking up all this knowledge - and can our brains absorb so much? Your young one perhaps, but my old one, I'm not certain! Currently just trying to get my ducks in a row for Ireland - leave Wed. - and so behind due to all the weather related problems of the past week here. Guess I'll be at the airport though, with one small suitcase and a back pack, rain gear and such. . . . . . . . . quite looking forward to exploring the countryside as this will by my first time there! With our Irish name we are hoping to be welcomed as we search for Bob's paternal grandfather's roots before he took the boat to Boston in the 1800's. Happy Mother's Day tomorrow Lisa - I know you are definitely one of the best! I'd like to take gun smithing lessons but nobody offers them within driving distance. I tried some of those on line courses and they were not very interesting. Have you read "the Great Influenza" about the 1919 epidemic? Good book but very frightening. Thanks for the info. Wishing you a very happy mother's day, Lisa. Enjoy your family on this special weekend. Wow, that's great! I have purchased many courses from The Great Courses, mostly audio versions. I like to listen to them in the car. What a great idea! My client has a book form 1986, based on the history of our county from the 1880's. Very interesting!